By Michael Wilkinson, Managing Director, Leadership Strategies, Inc. 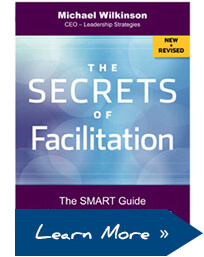 In my first book, The Secrets of Facilitation, I described the facilitation methodology we use at Leadership Strategies. SMART FacilitationTM, Structured Meeting and Relating Techniques, is based on ten principles that provide SMART facilitators with a clear vision of excellence in facilitation. Supporting the principles are specific techniques that demonstrate how SMART facilitators execute the principles in practice. Let's take a look at each of the ten principles. What are the most important steps in planning for a facilitated meeting? What are the key questions that you need to have answered? With whom should you speak to get prepared? What do you ask participants about the session? How do you know if you are well prepared? What are the four most important things to do in the opening? How do you get the session started on time? How do you get the participants excited about participating? How do you get buy-in to the agenda? What parking boards should you use? What is the appropriate order of the steps in the opening? Principles 3, 4 and 5 make up the Facilitation Cycle. After getting the session started in the previous principle, you are now ready to begin the first agenda item. You first focus the group (Principle 3), use the power of the pen (Principle 4) and perform information gathering (Principle 5). When you are done with the first agenda item, you go back to focusing the group and go through the cycle for the second agenda item, and so on, until all agenda items are covered. What should you do at the beginning of every agenda item to get the group focused? When significant time has passed since the last session, how do you restart and get the group focused? How do you avoid asking your first question and getting complete silence? How do you give directions that are accurate, clear and concise? What are techniques for keeping a group on track? How do you effectively use breakout groups? What is a way to keep groups focused during report back sessions following breakout groups? What is the most important information to document from a facilitated session? How do you avoid abusing the power of the pen? How do you manage the recording process while still facilitating the group? What do you do when a participant gives you a long monologue? How do you prevent lulls while you are writing and trying to catch up? How do you effectively use a scribe during the session? What is an appropriate format for the documentation? SMART facilitators know that the most important tool for a facilitator is questioning. Rather than just using open- and closed-ended questioning techniques, SMART facilitators have a full toolkit of questioning tools, each designed for a specific task. Facilitators must have a wealth of other information gathering and processing tools at their disposal as well in order to address a variety of needs. Some tools are for gathering facts, others for generating ideas, and still other for categorizing, prioritizing, reporting and evaluating. This principle covers the following. How do you phrase questions that create a bonfire of responses? How do you use questions to guide a group? How do you float an idea without unduly influencing the group? What are the major information gathering and processing functions? What is the most important thing to do in a brainstorming session? What are the three critical activities in prioritizing? How do you maximize Q&A sessions to ensure that the most important questions get asked? How do you ensure quality feedback during a report back process? How do you perform an evaluation of the session without the feedback being biased by the comments of one or two people? While Principles 2-5 lay the flow for a facilitated meeting, Principles 6-8 focus on group dynamics. A facilitator skilled in the techniques covered in Principles 2-5 will understand the mechanics of facilitation. The group dynamics information in Principles 6-8 provides the tools for managing group behavior. How do you deal with someone who is constantly saying, "No, that won't work. We've tried it before, and it won't work. It's a bad idea. It's not practical. It's not realistic. It just won't work?" What about the people who want to dominate the discussion? Or – just the opposite – the people who sit there and say nothing, until they go out the door and then tell everyone how much a waste of time the meeting was? How do you identify dysfunctional potential during the preparation stage? What are strategies you can take prior to the session to prevent dysfunctional behavior from occurring? What are the needs and typical dysfunctions of the different communication styles? How do you detect dysfunction early? How do you address some of the more common dysfunctions such as the drop-out, the nay-sayer, the whisperer, the verbal attacker? What do you do when something unexpected happens in a session, such as an emotional outburst? How should you respond when one or more participants indicate you have made a mistake or suggest a change to the process that you don't want to make? What is the definition of consensus? Why might full consensus not be the recommended approach for group decision-making? What are the three reasons people disagree? How do you address a disagreement in which the argument appears to be irrational? How do you slow down a conversation to ensure that everyone is getting the facts? How do you resolve a disagreement based on different values or experiences? What is the impact of energy on the session topic, the session participants, and the participants' view of the facilitator? How do you start a session with energy? How do you maintain energy throughout a session? What are the lullaby times during the day and what should a you do about them? When are team building activities appropriate? How do you use them well? What are the most important activities to do before closing a session? What do you do with the participants' personal objectives identified at the beginning of the session? How do you ensure buy-in and commitment to the decisions made in the meeting? What do you do with the items remaining on the Issues List? What are guidelines for assigning responsibility for the Action List? What feedback is needed from the team and the sponsor of the meeting? What do you do if it looks like you are going to exceed the scheduled ending time? What is a standard agenda and why do you need it? How do you customize a standard agenda to meet a specific need? How do you create an agenda from scratch? How do you ensure that you know your process cold? How does an agenda differ from a detailed facilitation guide? What should be included in a facilitation guide? Together, the principles and techniques comprise a comprehensive methodology for SMART FacilitationTM that can be used to produce consistent, repeatable results. Interested in learning the 100+ techniques for putting SMART Facilitationtm into practice? Check out our course, The Effective Facilitator. Michael Wilkinson is the Managing Director of Leadership Strategies – The Facilitation Company, and a much sought after trainer, facilitator and speaker. He is a Certified Master Facilitator and a Certified Professional Facilitator. As a past president of the Southeast Association of Facilitators and a board member of the National Institute of Facilitation, Michael is a national leader in the facilitation industry. You can get more tips from either of Michael's books, The Secrets of Facilitation or The Secrets to Masterful Meetings. You can receive a signed copy through our website.